Goodbye cold toes, hello warm feet! The Womens Thunder Bay Texapore High Boot from Jack Wolfskin will keep your feet warm as toast at temperatures down to around -30 °C. The fleece lining provides the cold-busting spec. The high-cut water-resistant suede and fabric uppers provide extra warmth. Water beads up and runs off the uppers (dry material = warmer feet), while the membrane blocks any water that might seep through. 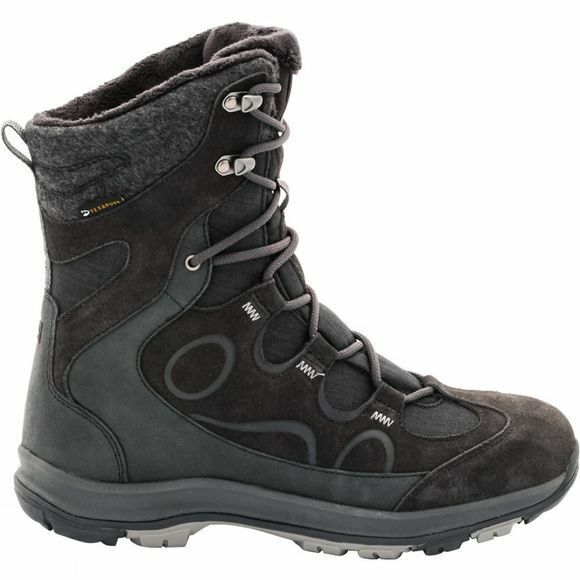 The sturdy, anti-slip Wolf Snow hiking sole provides good grip on both icy pavements and wintry woodland trails.